It is liberating to throw out what you know and venture into a land of unknown and savory promise. And with my motto being “we can always get take out” I truly figured I had nothing to lose. They all seemed like easy enough recipes, just different. It was exactly what I needed. So, the first “new” meal was empanadas. It isn’t surprising that other countries have their version of a meat pie. 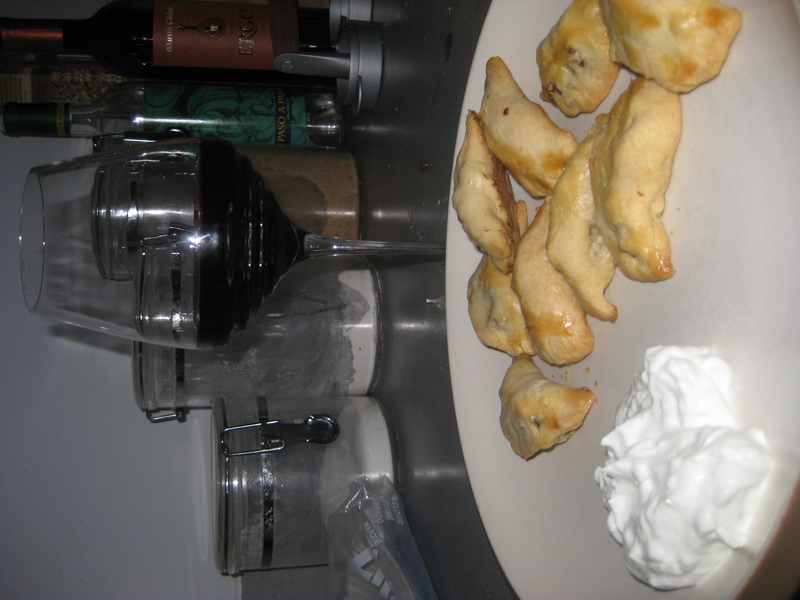 I have made Kibbeh from Lebanon, we have pot pies, there are Russian meat pies, and the Spanish have empanadas. Then, adapted by Latin American countries, they shrunk it a bit and established the same technique. I got this recipe out of Real Simple, thinking it couldn’t be overly difficult. Like any food where you have to mold each bite, it does take a bit of time, but it isn’t terribly complicated. And, with a store-bought pie crust, the effort is significantly decreased. The spices in the meat are amazing, but I will note this – the recipe calls for 80/20 meat and I did find it to be a bit greasy. Next time I will be opting for a leaner choice. Also, my biscuit cutter was a bit small, so next time I will be purchasing one that is the size they recommend – providing a better meat to crust ratio. Might even jazz up the sauce a bit with some creme fraiche. But all and all my culinary experiment was a success. Not only was dinner amazing, but I learned I could do something new, and I expanded my skill set. I suggest you all do the same! Heat oven to 375º F. Heat the oil in a large skillet over medium heat. Add the onion and cook, stirring occasionally, until soft, 5 to 6 minutes. Add the beef and cook, breaking it up with a spoon, until no longer pink, 3 to 4 minutes. Stir in the raisins, ketchup, cinnamon, ½ teaspoon salt, and ¼ teaspoon pepper. Using a 2½-inch round cookie cutter, cut out circles from the piecrusts. Divide the beef mixture among the circles, brush the edges with water, fold in half, and press with a fork to seal. Transfer to a baking sheet and brush with the egg. Bake until golden, 20 to 25 minutes. Put the sour cream in a small bowl and sprinkle with the lime zest. Serve with the empanadas. I have never met a bruschetta I didn’t like – and after traveling to Italy, I have a deeper love for the appetizer. 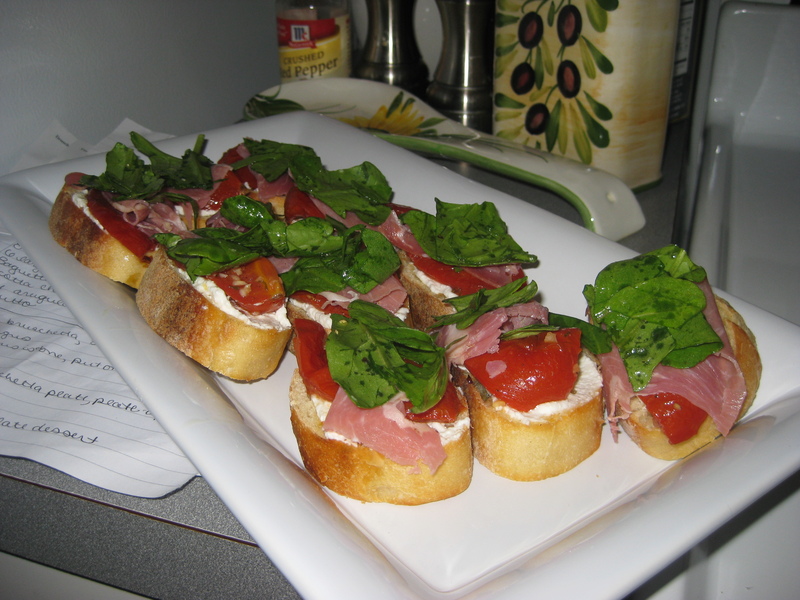 What I love about bruschetta is you can improvise and make it as complex or simple as you want. You can add really whatever you want atop the crusty bread, and it always seems to taste fantastic. This bruschetta recipe does take a little extra time because you roast the tomatoes, but I find it is worth it for the deep flavor. I love the crispy, light addition of the arugula (not to mention it adds the green in the Italian flag to make it a true red, white and green Italian dish!). I made this for a dinner party and it went over well – I roasted the tomatoes and baked the bread in advance, then assembled when everyone arrived! Thanks to Bon Appetit for this great antipasti! If you are like me, your “main dish” stash of recipes sure outweighs the appetizers one. Perhaps it is because I cook dinner 5-6 nights a week, which gives me lots of times to try out lots of recipes. And it always seems when you do an appetizer, you are entertaining – and you rarely try out a new recipe on other people (unless you are crazy like me!). That being said, I put this one in my recipe book a while back and hadn’t used it in a while. 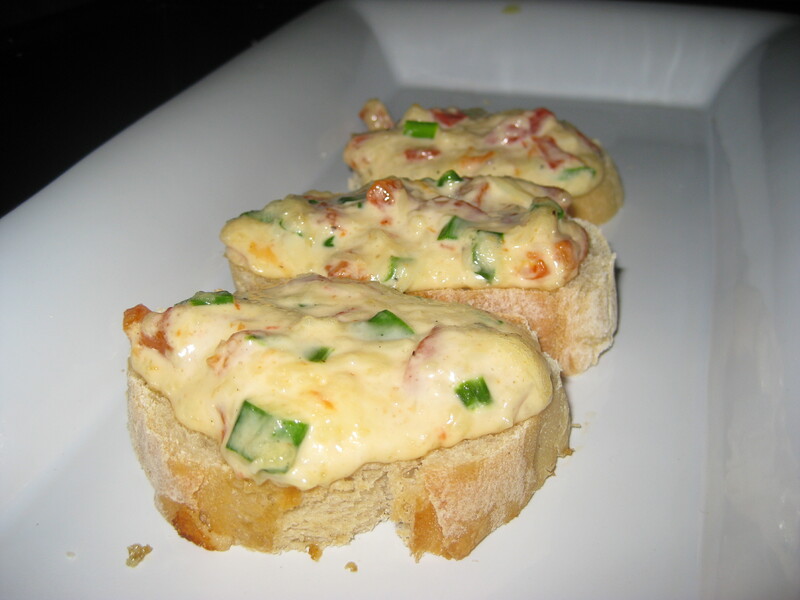 I pulled it back out for New Years – thinking even though it was just my husband and I, it was a special occasion and therefore warranted an appetizer! It is very simple, and to be honest, I forgot how good it was! They are rich, though, so no need to make that many. I googled the recipe and found it on CD Kitchen submitted by Kay from West Virginia. I knew the recipe came from somewhere so I wanted to make sure I gave that person credit! Preheat oven to 350 degrees F. Mix cheese, mayo, onions and red peppers in a bowl. Spread mixture on bread slices. Place on baking sheet. Bake 3-4 minutes or until golden brown. I am currently still licking the sauce off my fingers from this one (sorry, Mac keyboard) – literally made them only a hour ago for the NFL playoffs and couldn’t wait to blog them. If that doesn’t say something about these wings, not sure what does! As the SuperBowl is quickly approaching, I am always looking for great “football” food to serve at whatever party we attend or host. These will be brought to our friends’ house this year, no question! This particular recipe was in a great article in Food & Wine magazine (thanks for the subscription, Mom & Dad!). The article gives you a great basic hot wing recipe, then all of the great ways you can mix them up and give them different flavors. 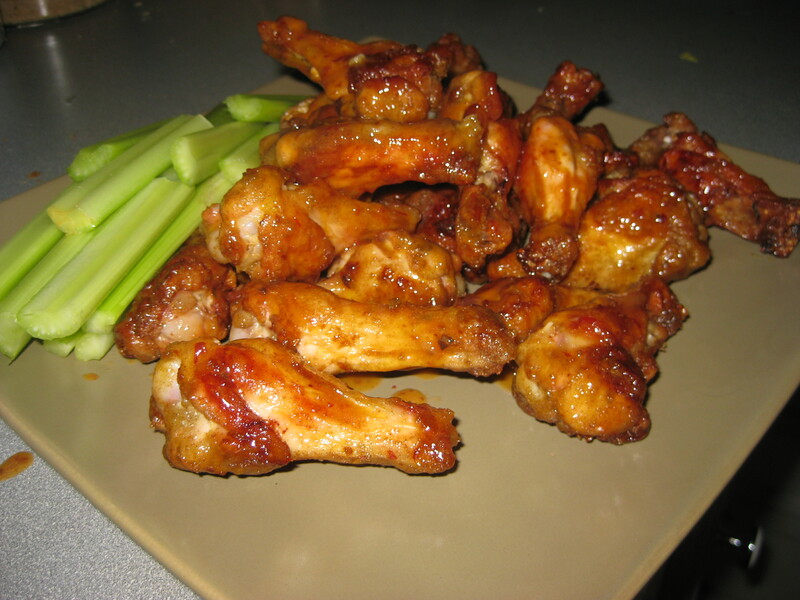 These are the maple chipotle hot wings, but I will surely be trying the others soon! Something to note – yes, you roast them for 45 minutes at 500 degrees. The mixture of the dredging, the veggie oil and high temperatures gives them a crispy skin, almost like they were fried. Preheat the oven to 500°. Line a large baking sheet with foil and spray with vegetable oil. In a bowl, mix the flour with the salt and sage. Add the chicken and toss to coat. Spread the chicken on the baking sheet in a single layer and spray with vegetable oil. Roast the chicken for 45 minutes, turning once or twice, until browned and crispy. In a bowl, whisk the hot sauce, butter, chipotle pepper and maple syrup until combined. Add the chicken wings to the sauce and toss; serve. I am always looking for great appetizers when I have company, and dips are normally the default, since they can be made in advance. So when I found this mini crab cake recipe that can be made mostly in advance, I was thrilled. Not to mention crab cakes are surely on my top 10 list of favorite foods! This recipe is easy to make in advance, and I made most of it the morning before the party, then threw it in the oven when company was here. It is unique because the citrus really comes through as a “hmmm, what is that great taste?” type of secret ingredient. Thanks again to Bon Appetit for this one! Using electric mixer, beat cream cheese in medium bowl until smooth. Add 1/4 cup Parmesan and egg; beat to blend. Beat in sour cream, citrus peels, 4 teaspoons chopped chives, coarse salt, and cayenne pepper. Fold in crabmeat (this portion can even be made one day ahead!). Cover and chill. Preheat oven to 350 degrees. Generously butter 2 mini muffin pans. Toss panko, 1/2 Parmesan and 2 tablespoons chopped chives in small bowl. Drizzle 1/4 cup melted butter over, tossing with fork until evenly moistened. Press 1 rounded tablespoon panko mixture into bottom of each muffin cup, forming crust. Spoon 1 generous tablespoon crab mixture into each cup. Sprinkle rounded teaspoon of panko mixture over each. Bake crab cakes until golden on top and set, about 30 minutes. Cool in pans 5 minutes. (can be done a few hours ahead – if so chill then rewarm at 350 degrees for 6-8 minutes when ready to serve). Run knife around each cake and gently lift out of pan.